The Economic Impact Report of Tourism for Oxfordshire, a report commissioned by Experience Oxfordshire, has revealed a positive picture for tourism in 2015. The study showed that the sector supports 33,447 jobs in Oxfordshire, a rise of 4.2%. Further good news is the increase in overnight stays – a key driver for growth in the visitor economy – as hotels benefited from a 5% increase in overnight stays and the County benefited from a 4.1% increase in the value of overnight stays. Domestic visits to Oxfordshire remained unchanged between 2014 and 2015, which mirrored the national trend, but spend still increased. However domestic nights per stay rose by 3.4%, and expenditure grew by 4%. In comparison to this, overseas trips increased by 8% from 2014 to 2015, as well as nights per trip (10%), and expenditure (3%). As a result of the increase in international trips, overnight stays from international visitors reached 0.6 million, with an average spend of £27 million per month in the local economy. The main reason for trips both domestic and overseas, at 53% is holidays, whilst 22% are for visiting friends and family, 20% for business purposes, and the remainder can be accounted for by study, and other purposes. Oxford City remained the most visited area in the County. The main reason for all trips from both overseas and domestic travellers was for holidays, with an average stay of 2.9 nights, and expenditure of £231.43. Visitors to the County most commonly spent their trips staying with friends and relatives (41%), or in serviced accommodation (25%). The remaining 34% was accounted for by camping, group/campus, self-catering, second homes, boat moorings and others. Total direct visitor spend for 2015 was £1.54 billion, with the highest area of expenditure coming from the food and drink sector (32%). The remaining sectors that contributed to overall visitor spend included retail (23%), travel (22%), accommodation (13%), and attractions (10%). Employment factors were also analysed, with figures showing that 33,447 jobs are supported by the tourism economy in Oxfordshire and 13,823 jobs in Oxford specifically. This means that 1 in 9 of all jobs in Oxford are a result of the booming tourism economy, with 1 in 11 jobs within the County as a whole accounted for by tourism. Overall, the figures found within the commissioned report reflect a thriving tourism economy in Oxfordshire that has continued to grow year on year. Experience Oxfordshire is the Destination Management Organisation (DMO) for Oxfordshire. We are a not-for-profit partnership organisation committed to the promotion, management and development of Oxfordshire as a great destination to live, work, visit and do business. We have a growing partnership network of businesses spanning all parts of the visitor economy, and through effective collaboration we are all working to ensure Oxfordshire becomes a leading destination for tourism, culture and business. 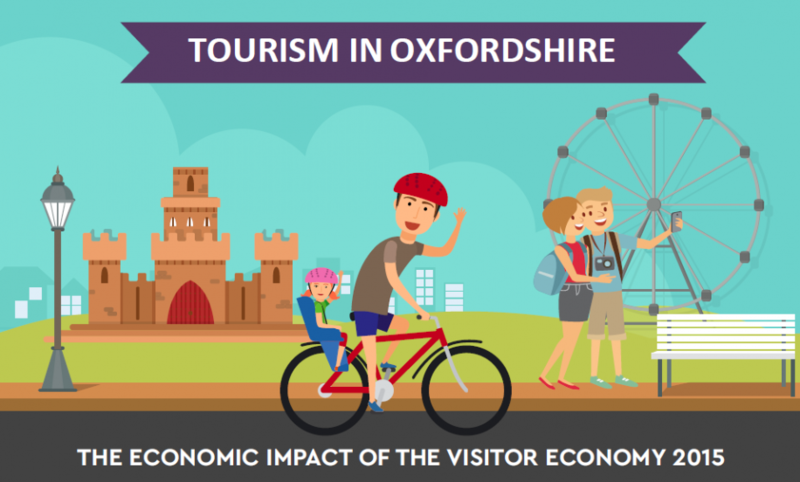 The Economic Impact Study conducted for Experience Oxfordshire examines the volume and value of tourism to the local economy, with further regard for employment generated as a result of this tourism. It assesses these factors using the Cambridge Economic Impact Model, which utilises information from regional data, and national tourism surveys. The research was undertaken by Destination Research here.